Innate TCRγδ+ T cells produce IL-17 in C.
albicans–infected kidney. (A) WT mice were either subjected to disseminated C. albicans infection or left uninfected (sham) (n = 8). At day 2 p.i., renal mRNA levels of Il17a, Il17f, Il17c, and Il17e were quantified by qPCR. (B) Single cell suspensions from the perfused kidneys of C. albicans infected or sham IL-17eYFP mice (n = 6) were used to determine the number of eYFP+ cells (gated on live CD45+) at day 2 p.i. 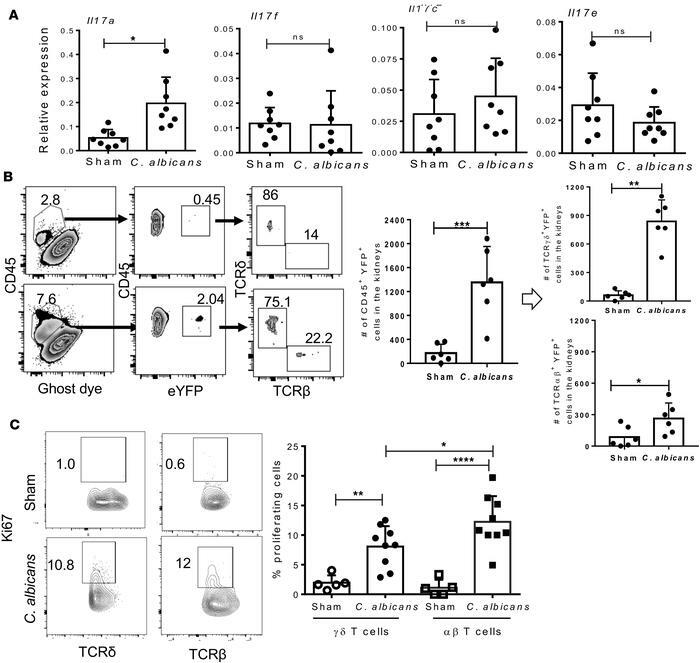 Absolute numbers of innate TCRγδ+ and TCRαβ+ T cells producing IL-17 were evaluated by gating on live CD45+eYFP+ cells. (C) Percentages of renal Ki-67+TCRγδ+ and Ki-67+TCRαβ+ cells from C. albicans–infected (n = 9) or sham mice (n = 5) (gated on live CD45+ cells) at day 2 p.i. Numbers in the zebra (B) and contour (C) plots reflect percentages of cells. In the dot plots, each dot represents an individual mouse, and data are represented as mean ± SD and compared by 2-tailed Student’s t test for A and B and by 1-way ANOVA for C. Data are pooled from 2 independent experiments for A–C. *P < 0.05; **P < 0.01; ***P < 0.001; ****P < 0.0001.